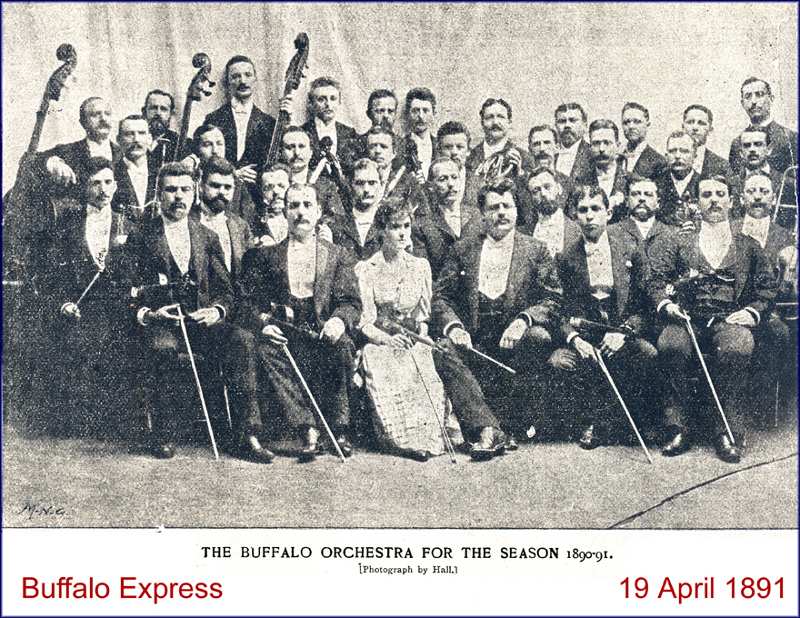 Buffalo Orchestra, organized in 1920 by a civic group; established under the Federal Music Project in 1935. Seventy-six players. Franco Autori, cond. Jointly Sponsored by the Buffalo Philharmonic Society and the Federal Music Project. In addition to the relief and nonrelief musicians on the project payrolls, some of these orchestras were augmented by musicians paid by a sponsoring organization for either a series of concerts or single concerts. In some cases extra musicians were paid by the local musicians’ union or by municipal groups such as park boards. It was a critical time, but from the very first downbeat, the Society’s Board of Directors got everything right. Through the leadership of Society President Mrs. Edgar F. Wendt, funds were raised to maintain a viable ensemble through 1937 when support was received from the federal WPA project, which sponsored additional players and recruited a conductor named Franco Autori from the Dallas Symphony. Over the next two seasons (despite a variety of administrative and financial growing pains) the Orchestra presented many fine symphonic performances with renowned soloists, and began performing run-out concerts to neighboring localities like Niagara Falls. Finally, by the opening of the 1939-40 season, the Society and the Greater Buffalo community were ready to provide enduring support for the expansion of both the classical and lighter ‘Pops’ programming by its burgeoning orchestra. The organization surely existed prior to 1931 in some form, but as the history of many of these orchestras from the late 19th and early 20th century show, there were often starts and stops in activities as well as name changes. Even the sources which date from the period are not much help in this regard–and note that the McDonald work was actually written during the period as the publication of the study, originally funded by the Rockefeller Foundation, but funding for the publication of it in 1945 was pulled for some reason or other. What’s intriguing about the McDonald book is the sections outlining the pre-WPA relief initiatives that helped to support or sustain many orchestras through the Great Depression. TERA (Temporary Emergency Relief Administration) was the New York state equivalent of the FERA (Federal Emergency Relief Administration) program which preceeded the WPA and its Federal Music Project. The CWA is the Civil Works Administration which interrupted the FERA program for a few months. And if 67 of the 79 members were funded by the WPA till the organization went private in 1939, it was for all intents and purposes primarily a federally funded organization. The question is, how many of these orchestras might never have existed had there not been substantial federal funding during the Great Depression years and also, which orchestras actually did get funding and for how long and in what monetary amount? This period is as good a period of crisis for the Classical Music World as any (and better than what some folks are calling the current crisis) but it was averted in ways that other performing arts cultures (such as the professional Chinese Opera Troupes in New York during the Depression) were not.